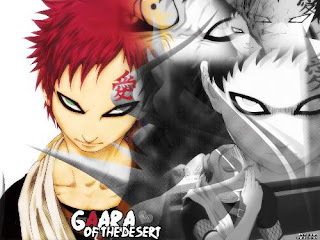 Angel in the Sickroom: Gaara. In Naruto, I really pity Gaara. He only grew up as a monster because the Hidden Village of Sand’s villagers treated him as one. He’s suffering from psychological problems because of the trauma he encounters daily with the villagers. His father is no good either as his father made him into what he is in the first place, a monster. If you watch Naruto you would know what I am talking about and maybe feel what I’m feeling. Gaara really wanted to change and he wanted to live in peace with the people. The stupid people didn’t gave him the chance to change so I wouldn’t blame Gaara if he killed all of the villagers and enjoyed watching them die in pain slowly! Hahaha!! !